Phew! It’s been a busy May around cookblognosh. A lot of travel that bookmarked the start of an awesome new job mid-month has meant not a lot cooking and creating by yours truly. But with summer nipping at our heals, I’m ready to get back to my favorite past time of sharing my recipes with you. In the next few months, look for recipes and tips for fresh veggies, grilling, and simple indoor cooking designed to avoid heating up your kitchen or melting away your time. This recipe for Potato Nests won’t keep your oven on for too long, keeping the heat at bay whether you want to enjoy them for brunch or dinner. The ingredients are easy to stock for a quick meal any time. I can’t get enough of those refrigerated potatoes for their convenience, especially when they’re on sale…which seems to be all the time by us. Low-sodium deli meat brings some extra protein and flavor without having to thaw and cut raw meat…it can also be omitted when desired. Some low-moisture carrot shreds provides a few more nutrients and a pop of color, store-bought cole or broccoli slaw mix would work well too. I would caution about adding other veggies though, as there might be too much moisture in them and will make a soggy nest. Get crazy and add some cheese, hot sauce, and/or some spices from your cabinet, or try sprinkling on fresh herbs to brighten things up. No matter how you do it, play away and enjoy! Preheat your oven to 375 degrees with a rack positioned in the middle. Grease a non-stick baking sheet with cooking spray or butter and set aside. In a small bowl, combine 2 eggs, olive oil, salt, pepper, and garlic salt. Reserve the other 6 eggs for later. 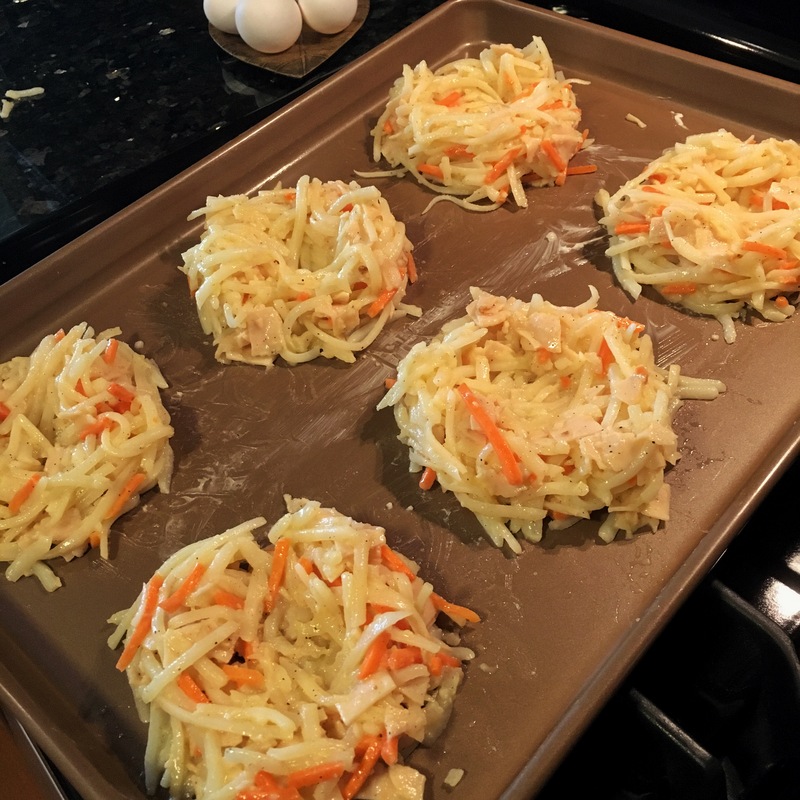 In a larger bowl, toss the shredded potatoes, carrots, and optional deli meat with the cornstarch. Once well coated, pour in the egg mixture and combine thoroughly. I find this is easier to just go in with your hands and get dirty. Measure out six 3/4-cup servings and space them evenly around your greased baking sheet. A mostly filled one-cup measuring cup will help you portion, and also give you the starting shape of your potato nest once you turn it out onto the baking sheet. Once turned out, use your hands to condense and firm up each nest. Then using your thumb, gently create craters in the middle of each, careful not to push all the way through though. This is where the egg will go after par-baking. Bake the nests for 15 minutes, then remove from the oven, and carefully crack one egg into the depression of each nest. A little might run over and that’s okay. Sprinkle each top with a little extra salt and pepper and return to the oven for another 10-15 minutes, depending on how set you like your egg yolks. Serve and nosh immediately or let them cool while you enjoy a nice garden salad before digging in.